This article views chapters from history textbooks as a glimpse into a particular zeitgeist of the current South African educational milieu. The central question is how these sampled books position a textual community as mediated by the topic of race theories impacting the twentieth century in various regions. To contextualise the topic, we provide a brief overview of similar studies and present some voices in current debates about the meaning and relevance of conceptions of race and racism. We then analyse data, providing examples and illustrations. The five major emerging themes from the discourse analysis of the texts are that authors 1) write from a single perspective showing intolerance of ambiguity; 2) have an a-historical or anti-historical position towards text; 3) write from a reductionist position; 4) mimic critical thinking; and 5) position themselves as scaffolds that create opportunities for inquiry. These findings are discussed in some detail. We conclude that the books are predominantly positioned to advance citizenship education in a specific mould and that they tend to repeat the letter of the "curriculum law" of democratising and of healing the divisions of the past, but in the process defeat the spirit of such healing. We end by considering some implications for textbook writing. Key words: textual community; race; racism; history textbooks; education; curriculum. In hierdie artikel ontleed die skrywers geselekteerde hoofstukke in geskiedenishandboeke as opvoedkundige blik op die zeitgeist van hedendaagse Suid-Afrika. Die hoofvraag van die studie is hoe hierdie handboekhoofstukke die lesersgemeenskap posisioneer deur die instelling van die outeurs. Die skrywers fokus spesifiek op die tema van ras en rassisme in die hoofstukke, soos dit in die boeke uitgebeeld word in verskeie wêrelddele in die twintigste eeu. 'n Aantal soortgelyke studies word bespreek om hedendaagse idees en gesprekke oor die temas van ras en rassisme uit te lig. Hierop volg voorbeelde van die data, waaruit die vyf hooftemas dmv diskoersanalise van die handboekhoofstukke saamgestel is. Uit hierdie analise van die hoofstukke is die volgende temas uitgeken: 1) outeurs skryf grootliks vanuit 'n enkele perspektief op die geskiedenis en is onverdraagsaam met dubbelsinnighede; 2) hulle skryf vanuit 'n a-historiese en selfs antihistoriese instelling; 3) hulle gaan reduksionisties om met die inihoud; 4) kritiese denke word "nageboots"; en 5) sommige slaag daarin om geleenthede vir ondersoeking te skep in die teks. Hierdie vyf bevindings word in die artikel taamlik breedvoerig bespreek. Die gevolgtrekking van hierdie deel van die groter navorsingsprojek, en wat in hierdie artikel weergegee is, is dat die hoofstukke wat ontleed is gerig is op 'n spesifieke soort burgerskaponderwys; die teks hou baie nou by die "letter" van die kurrikulum, wat voorhou dat geskiedenisonderwys demokrasie moet bevorder en die wonde van die segregasie verlede moet heel, maar faal in die proses om die "gees" van die kurrikulum te handhaaf. Die artikel word afgesluit met die moontlike gevolge wat so 'n instelling/posiosionering inhou vir die skryf van teksboeke. Sleutelwoorde: teksgemeenskap; ras; rassisme; geskiedenishandboeke; onderwys; kurrikulum. History textbooks have a significant role to play, especially in South African classrooms, where many teachers have no access to any other media or subject knowledge.1 The importance of textbooks was also highlighted by the Report of the History/Archaeology Panel to the Minister of Education, which emphasised that "history textbooks cannot but remain central to the cause of an improved history education".2 This was more recently echoed in a speech by the Minister of Basic Education, Angelina Motshekga, who opined that the textbook is the most effective tool to ensure better quality instruction.3 Against this background, this article aims to show how texts discursively construct or encode a cultural mindset prevailing in a particular Zeitgeist, namely as represented in some of the recently published history textbooks for grade 11. In the table below the textbooks used in this study are identified. This study is part of a larger one that investigated this particular chapter in the 10 textbooks and their teacher guides in some detail. The data for the larger study and for this article comprised all texts such as narratives, explanations, definitions, activities and the teacher guide's suggested answers, photographs, and the overall design features of the textbooks.6 In addition, the introductory pages were also studied to establish the general tone and the authors' stance towards readers. This was in to establish the authors' attitude to history education and how he or she views the end-user of the text. In addition, the larger study aimed to suggest criteria for evaluating history textbooks and hence entailed the design of a methodology for text analysis more generally by putting the designed five-dimensional tool to work on the data. In this article we focus only on the results of one of its dimensions, namely how authors position their work vis-à-vis their envisaged textual community. To contextualise this question, we briefly review some international and South African textbook studies; expose current trends in thinking about race and racism; discuss the methodology of the study; and present our findings. Finally, we discuss the findings that have an implication for curriculum and textbook development. In other words, the strategy is not only to avoid argumentation but also to avoid conflict by relegating its underlying reasons to the realm of obscurity or the incomprehensible. The implication of the research reviewed here is that it is crucial to unpack the subject of race and racism in terms of its representation in and teaching through history textbooks, which are media that influence their consumers in powerful ways.14 Moreover, the topic as represented in grade 11 history textbooks has not been analysed before and hence adds new knowledge to a growing interest in textbook research in South Africa. Furthermore, this topic has significance beyond the classroom because it is not just a historical issue, but one that continues to be pivotal in the social discourses of everyday life, from schools to universities, to education policy, to politics and systems of justice in South Africa and globally. Hence we see it as necessary to focus attention on some pertinent issues in current debates on race and racism. This will contextualise the topic in a wider academic and scientific discourse quite apart from that in school textbooks. We turn to this next. Eberhardt concludes that researchers are tracing the neurobiological effects of people's racial beliefs, attitudes, and knowledge in a manner that appears to highlight (both to scientists and to lay people) the socially constructed nature of race.22 Such research, and those exploring the evolutionary bases of race, informs the key notions of social construction arguments as delivered (or not) by the textbooks as they mediate knowledge about this complex and controversial subject. What such declarations do not point to is that "scientific and ethical considerations" are hardly straightforward, and when including them there is possibly a need to consider racism not only from the "victim's" but also from the "perpetrator's" and even "bystanders" perspective.25 This would be welcomed by Oteíza and Pinto, who found in one Spanish textbook that the "only allusion to the injustices of the past makes no specific reference to the victims or the perpetrators, as if everybody suffered equally and nobody was directly responsible".26 Such omissions are critical because as Klein discusses with regard to the criteria for selecting children's reading material in schools, the victims of racist bias are both those who dominate and those who are dominated, and that they cannot have a normal relationship with themselves or with others.27 I would add that the "bystanders", or those who do not speak or act up in the face of injustice, are also victims in the sense that they too are affected. Racism destroys all parties because it dehumanises.28 This brief discussion about race and racism demonstrates the seriousness of the issue and by implication its significance for analysis in history textbooks. We wanted to find out how the texts position an envisaged textual community of readers. This type of analysis is based on how social classifications and positioning of the subject occur in communicative actions and events.29 Text production is a communicative act in which users bring with them different dispositions towards the shared system of signs (in this case, text). This is what discourse analysis aims to deconstruct. Thus we looked at how the texts speak about the (dis)positions of the authors and noted discourse markers indicative of this. For example, we looked at the kinds of "uses" the past was being put to, rather than the kinds of historical skills mediated in the texts (this was another dimension in the text analysis model we designed; it is not included in this article). We identified discourses that said something about the implied conception of the textual communities for whom the authors write. Authors of educational texts write with a specific brief. They write pedagogical texts that are aimed to educate and they thus have a specific audience in mind. After this first level of open coding, we knew which types of data samples contained notable content about author positioning, but such data was still too "raw" and the notes were voluminous. Hence a second level of analysis was needed to both abstract and to reduce the data. In this analysis, the initial notes were coded deductively in terms of the five-dimensional model that had been designed from a study of literature on mediation and semiotics in education.32. All the data pertaining to author positioning, which was one of the dimensions of the analytic tool that had been designed, was put together for further refinement. As Henning, Van Rensburg and Smit describe, such data was divided into smaller units of meaning, which were then systematically "named" per unit, or "coded according to what a unit of meaning signifies for the researcher".33 Such units were then grouped together into clusters of codes, containing related codes. These clusters of codes were "further removed from (material) reality" or abstracted by "thematic organisation",34 which entailed a process of extracting and constructing themes from the clusters. We list five overall themes in this article and discuss them with examples from the texts. 1. The author writes from a single perspective, showing intolerance of ambiguity. 2. The authors' position towards text is a-historical or anti-historical. 3. The author is in a reductionist position, reducing complexity. 4. The author mimics critical thinking. 5. Authors position themselves as scaffolds that create opportunities for inquiry. The first four themes were consistently found in seven of the ten grade 11 textbooks listed at the beginning of this article. The fifth theme dominated in the other three books. This theme was developed from the discursive practices whereby authors made sweeping/blanket generalisations and appeared to use selective extracts from stories that were unrelated to each other so that they would fit (but not challenge) the themes, arguments and value lessons to which the authors seemed openly committed. Book 3 in particular showed several instances of this. For example, in the introduction, the learner is urged to "ensure that any information you have is interpreted clearly and unambiguously", or "decide how accurate the information is", as if there were a simple standard by which to measure it.35 Multiple interpretations and conflicting views are thus by implication not allowed. And the chapter itself follows this direction, together with difficult-to-follow logic of explanation. For example it justifies European dismissal of the indigenous knowledge system in their colonies "as a matter of fear", although the following sentence talks about ignorance: "The colonists and administrators did not want anything to upset their comfortable sense of superiority and so they refused to consider any ideas or thoughts from their local subjects. "36 There are no multiple perspectives that are interrogated. Another way in which intolerance of ambiguity was shown was the avoiding of controversial subjects (such as genetic research on biological bases of behaviour) and the mismatching or disjoining of pictures, captions and their relation to narrative texts. An example of how images and texts are juxtaposed to fit the single commitment position is shown in Figure 1. 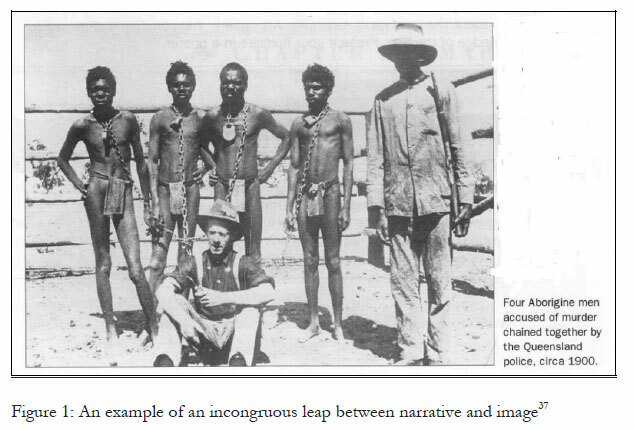 However, the caption of the picture states that the people in the photograph had been accused of murder and were thus chained together and guarded by the police. This juxtaposition seems to want readers to associate white employers of Australia at the time unequivocally with the habit of putting their staff in chains and guarding them with rifles. While this may have been the case, the narrative does not match the visual evidence. In this particular chapter in the books, a major topic is that of pseudo-scientific race theories. These theories are said to be backed up by seemingly scientific facts and figures but upon closer inspection, turn out to be false or skewed or are "falsely believed to be scientific".39 Examples are Social Darwinism and eugenics. Although most of the books do not enter into a debate about what "real" science is, we would argue that pseudo-sciences in these cases were only recognised as such with the benefit of hindsight and that it is crucial to include the historicity of ideas in such a chapter. The point is that the quest for science in the nineteenth century and the resultant rise of the theory of Social Darwinism and eugenics was not falsely believed to be scientific at the time; progression in science itself proved them to be false. It was the culmination of the methods of inquiry and the empirical evidence that could be harnessed by these methods at that time that fortified this view. Thus, because of the zeitgeist, the defining spirit or mood of that particular period in history, those who promoted such ideas can safely be assumed to have fully believed in them (like scientists do with the knowledge at their disposal in any era), even though their methods may have been questionable form a contemporary knowledge base. The idea that science is a cultural practice and a practice of culture40 is entertained by only one book, (book 8).41 The others do not mention defeasibility of theories or the role of presentism in interpreting theories from previous eras, or that scientific concepts change. One way this became evident was through inconsistent or incomplete referencing of sources, not authenticating primary sources, and using the same secondary sources repeatedly. The critical assessment of primary sources was only invited by using contemporary, one-sided "evidence" and not using counter positions from the time of the primary source itself (thus using wisdom of hindsight). Some texts did not examine the prevailing mentality, the zeitgeist of the time, thereby ignoring the historicity of ideas, events and people. Others did not tell stories as such, thereby stripping historical texts of their drama, resulting in a compilation of information. In some instances, primary source accounts were dropped in favour of informing through secondary sources and there was superficial skimming over of many topics. If there is no coherence, and thus no indication of links and connections between sections, this indicates that authors shift positions constantly. An example of a "fragment of evidence" is provided in book 4. 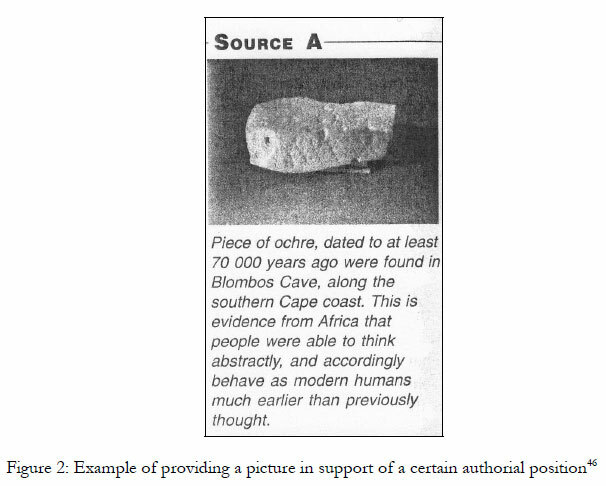 It is a photograph (Figure 2) of a piece of ochre found in the southern Cape "dated at least 70 000 years ago", which "is evidence from Africa that people were able to think abstractly, and accordingly behave as modern humans much earlier than previously thought".47 There is no context to the illustration and hardly any discussion. The average high school student would need to know some archaeology in order to fully grasp what is said in the caption. But this "critical perspective" is only allowed using contemporary, one-sided, pre-cast "evidence" and not counter-positions from Linnaeus's own time. To develop a critical perspective, learners should be given the chance to use evidence from the time period they are investigating. Wisdom from hindsight is presentist and not really wise at all since it disregards the historicity of ideas. The provision of simple answers to complex problems was a strong theme in the chapters. This position sees the community of readers as unable to deal with complexity. We argue that it is a patronising way of preparing learners to think about history. Moreover, it reveals a pedagogically and philosophically naïve, radically structuralist position. This relates to the single committed perspective which is achieved by reducing complexity, for example through the use of stereotypes of perpetrators and of victims. In some instances textbook authors presented simple aggressor/victim accounts through "us" versus "them" discourses. At times, they also tended to see problems and solutions as "either", "or"; or "black" or "white". The authors often collapsed colonialists and missionaries into one undifferentiated category (white Europeans). Colonialism was often equated with imperialism and both were equated with racism and indirectly with genocide. The notion of "difference" was often equated with racism; "marginal" was equated with "inferior"; being "different" was equated with "morally inferior". In some books there were simplistic definitions of key words such as "scientific - pursuing of truth through experimentation, using facts and systems"; and "racism - a belief that people are divided into different groups based on race".51 The latter would confirm Fritzsche's arguments set out above that "if everything is racism, then in fact nothing is racism".52 More nuanced definitions are needed. 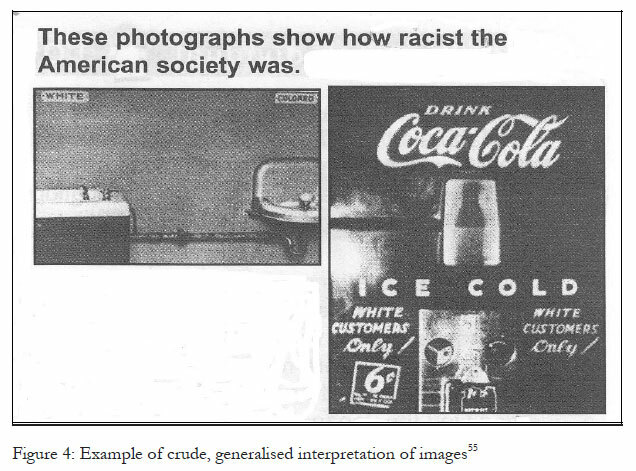 An example of this reductionist position is an advertisement in book 9 (Figure 4), drawing attention to segregation by skin colour in the USA (no reference information is given). In this example the authors' position is presented, instead of presenting a coherent history. This book often reverts to bland stereotyping and simplification, offering a superficial "understanding" of the concept of equality. For example, in pairs, learners are asked to identify "the factors that incited white racism" in the USA.53 The teacher guide suggests "prejudice, economic greed, fanaticism and political agenda",54 solving the problem in a few easy words. This kind of questioning and reasoning, we argue, is counterproductive and perpetuates prejudice, which ironically the curriculum seeks to change in a reconstruction of civil society in South Africa. A few of the books use an "illusion of critical thinking" strategy whereby an idea is presented and its interpretation is made to appear as if arrived at independently by the student, when in fact it was not. Some books began with a stated position of seeing learners as active agents in their knowledge construction, but then the materials did not deliver on this promise and the discourse slipped into that of "usable" past, presented in a package. This is intensified by the simplistic language usage and supports Chisholm's findings that South African "textbook writers write to a constructed image of their audience as barely literate; attempting to write in a popular vein to meet the needs of this population results in a child-like text".60 Chisholm further notes that "[u]nlike many of the international examples [of textbooks], the South African ones are generally chronologically weak, often superficial, and extremely information-poor",61 and thus by implication they hamper critical thinking as espoused by the curriculum. Nevertheless, some textbooks at least mimic critical thinking. An example is the treatment of the Ku Klux Klan (KKK) in book 1 (Figure 6). This is an extension exercise, meaning it is designed for more advanced learners. It is a screen shot of a KKK website. 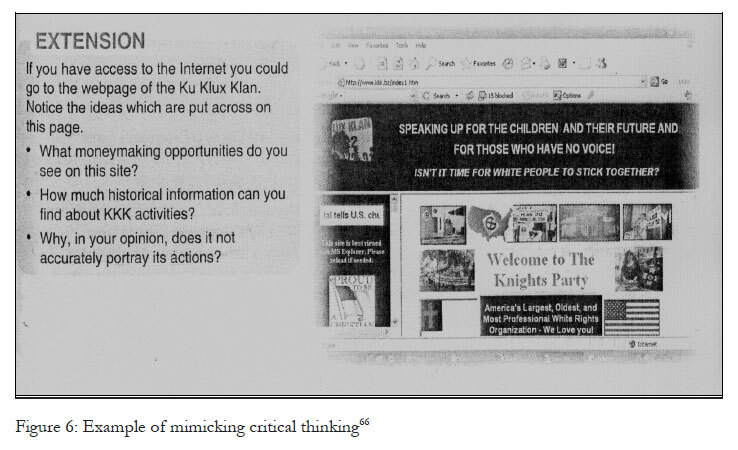 One of the questions asks "why, in your opinion, does [this website] not accurately portray its [the KKK's] actions? ".62 Such "opinion" could only have developed based on the preceding explanation of the KKK which was a single, distant perspective, narrating the history of the KKK from "the outside" in a simplistic black and white way. The author mimics, in a specific discursive manner, an invitation to the reader to deduce a conclusion by way of evidence, but the available evidence is rather partial. It would not contribute to "coming to independent, critical conclusions", as the curriculum would like it to do. Furthermore, by asking "why, in your opinion", something is not like this or that, implies that there is really no choice. The opinion must conform to the negative given. Another example comes from book 4. On the topic of the "Lost Generation in Australia", there is a question whether learners "would agree with the opinions source B expresses".63 Source B is a review article published in an academic journal about the film The Rabbit Proof Fence. It states, in part, that "British society and politics were strongly influenced by a revival of Christian Evangelicalism ... Their intent was to civilise and modernise the Aborigines, not exterminate them".64 By asking learners to agree or disagree, it looks as if they are meant to detect bias and come to their own conclusions, but the teacher guide precludes that by stating categorically that the answer to this question is "no". Students cannot agree with opinions expressed in source B; that would be wrong. The reason students cannot agree with this is that "systematic genocide wiped out almost ninety percent of the original population. The case for the Stolen Generation was an issue of international significance, made to the UN Human Rights Committee in Geneva".65 So even though a different perspective is given, i.e. that the intention behind the Stolen Generation may have not been genocide, learners are not allowed to entertain this line of thinking. Critical thinking becomes a mere pretence. Book 5 stood out on its own in many ways and can be regarded as exemplary in its position-taking. In this book the authors perform the "speech act" of critical composition themselves that could serve as examples for their readers, thereby building a scaffold.67 This was enabled through a concentration on, one case in an in-depth way, rather than fleetingly skimming over a range of topics in a superficial manner to address a topic. The book deliberately chose not to use terms that could reinforce racially discriminating discourse markers such as "inferior", "superior", "racist" and "racism". It encouraged the students do the thinking, interpreting, and finding answers by exposing them to a range of mainly primary source materials, reflecting multiple perspectives, and allowing them to "investigate", which was the name used for activities. The position is one of viewing history as a journey of discovery, for both teachers and learners. It has a strong orientation towards doing history through subtle and covert empowering strategies for the learners. One such empowering strategy was to reinterpret the curriculum in creative ways. For example, instead of using the words of the curriculum such as "What was the impact of pseudo-scientific racism and Social Darwinism on the nineteenth and twentieth centuries? ",68 this book chose chapter headings like "How did Fascism Challenge Democracy in the 1920s-1940s? ",69 and "What were the Consequences of the Failure of Democracy in Germany? 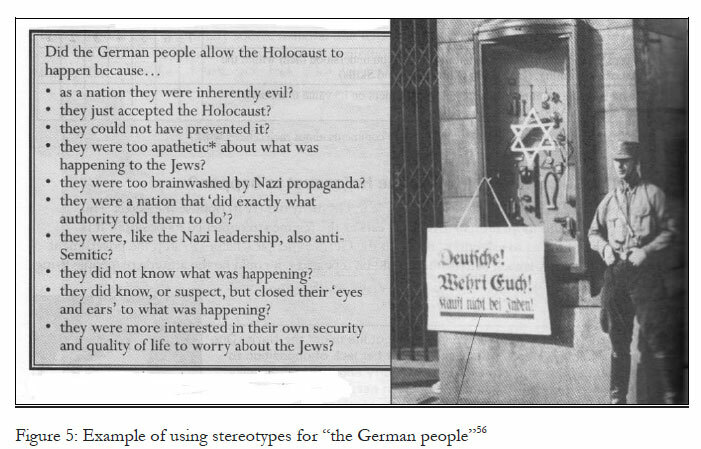 ".70 An example of how the assessment standards have been adapted to suit the authors' purpose is: "How useful would Sources 26-28 be to historians studying this aspect of the treatment of 'others' by the Nazis? "71 This matches with "evaluate the sources of information provided to assess the appropriateness of the sources for the task",72 but is not copied and pasted from the curriculum documents; instead, it is interpreted and applied to the case at hand to scaffold the task. It shows clear thinking and a constant effort to position readers as historians who are undertaking meaningful investigation. Another strategy in this book is a subtle and covert way of countering the ideas and messages of the story under scrutiny, without mimicry or reducing complexity. For example, when discussing the gender dimensions of Nazi Germany, the design of the activities points to a solution on how sexist stereotypes that readers learnt in the previous investigative activities can be countered in a practical, applied, non-threatening way. All the sources in an investigation on the sexist content are authored by girls or women.73 Thus the authors of the book openly defy the sexist propaganda exemplified in the previous section by demonstrating how women and girls were anything but fit merely as breeding machines for the Reich. It almost ridicules the propaganda without stating anything overt. Readers can make their own connections, even if this happens at a subconscious level. Another book, book 2, also stood out, to a lesser extent, by way of its generally objective and factual accounts that are concise and to the point, providing useful evidence to construct knowledge. The description of the learning outcomes and assessment standards in the introduction motivate students and hold promise to be fun and exciting by telling learners about the kind of analytical work they will be doing. The position here is thus not instructionist. The book promises that "we have not given you pages and pages of dull information. Rather, information is presented through features that are designed to help you interact with the information and easily find your way around".74 This tends to be true in the actual chapter. This is a well-written, objective description of the concept of scientific racism. It does not "blame" anyone, and the causal relationship is clear: Western thinking idolised science because it had led to many advances. This book also steered away from making promises which it did not deliver and explained clearly from the beginning that it is not possible to have an unbiased book. There may be different reasons why these books were exceptions. It may be that the publishers have different links to public and private education systems in the country. It may be that they had more time to compose exemplary texts and that they had established their niche in the lucrative market of school textbooks already, while the books that appear to have been written in a greater hurry had to compete in shorter timeframes. These conjectures were not pursued in this study, however, and are thus mere speculations. The discussion that follows in the next section is largely a generalisation about the remaining seven sampled books as far as author positioning is concerned. The question of how an envisaged textual community is positioned in the sampled texts can be answered by concluding that authors write for an "imagined community",79 one that shares the ideals of the curriculum, as well as one that understands and that will internalise the way the curriculum is mediated in these textbooks. Such imagined communities were created by putting the past to specific uses and through this, authors tended to reinforce racially discriminating discourses, instead of overcoming them. Some of the teacher's guides were particularly prone to prescriptive answers that did not take into consideration a multiplicity of interpretations and perspectives. Such guides tend to limit teachers' and hence learners' individual, personal knowledge-making, assuming that learning together means learning the same. But in a country where teachers have generally little access to other resources, it is understandable that they are part of the textbook package and they have their place. Perhaps an idea would be for them to refer readers to other resources, to include more possible answers and to caution constantly against simplistic answers, so as to keep striving to create a learner-centred environment true to the aims of outcomes-based education. To practise a "learner-centred" curriculum means to consistently know that knowledge is made in individual minds. The textbooks and the teachers mediate the knowledge through the semiotic systems of the books and other signs. If one accepts this basic tenet of Vygotskian theory,80 it holds that the semiotic quality of the sign (textbooks) has a discernable impact on the learning reader of this sign. To reduce or to shrink the signs into simplistic essentials is to reduce the learning. Another problem in the chapters that were studied is the mimicry of critical thinking. Critical and creative thinking as espoused by curriculum policy, and the creating of learning environments in which conflict is handled through debate and argumentation are not achievements that many rural, black schools are able to aspire to. In many cases learners at these schools are left to learn from these books as the only texts available to them. Thinking critically about difference and racial and ethnic stereotypes is not easily tolerated in such schools where instead, many teachers try to avoid conflict rather than encouraging and generating controversial discussion.84 In this respect, the textbooks and the contexts in which they are supposedly used fit into a matching pattern of conformity and a reproduction of traditions in the interest of preservation rather than progress,85 that is, if one accepts that progress can be characterised by debate and rational argument. It seems as if the majority of authors in this sample did exactly that - they collected isolated facts and snippets of information and deployed them as instruments for fulfilling the letter of the "curriculum law" at the called-for moment. To be fair to authors, they are no doubt restricted by publishers' criteria for the books. The time it takes to locate source materials; the cost of reproducing them (often carried by the authors); the fact that they need to cover major conceptual topics in very few words; and their interpretation of how the philosophy of OBE needs to be reflected in the book are all onerous criteria to meet. In the process, as the data showed, there was little room left for "being perplexed by a problem". Instead, authors seemed to start off by wanting to eradicate racism as represented in the curriculum with one fell swoop of textbook content. In this process they then used the (often purported) facts randomly for that aim, flirting with information as they saw fit. Whether it was an effective strategy or not probably seemed irrelevant. Writing from a single committed perspective was exemplified through an almost mantric emphasis on the idea that there is "only one human race", as if it needs such an emphasis at this juncture in human history and science, and as if the repetition of this piece of discourse would change conceptions and biases and their bedfellows - stereotypes. The almost evangelical and defensive tone diminishes the discussion of the science of human biology and anthropology, glossing over psychological differences of individuals regardless of pigmentation or culture. The current debates are not noted, for example in the work of some cognitive and developmental psychologists, who theorise about cognitive and linguistic development.87 Such researchers agree that the "environment" is much more elusive and difficult to define and measure than previously thought. They argue that there is an interplay between timeous exposure and stimulation during the crucial years of young children's development and the cognitive architecture that develops. The psychology of learning and of reading does not appear to have been taken into account in the style and content of authoring. In order to present the topic of racism and race from multiple perspectives, it would seem important to document cognitive science research and also research on conceptual change, and to be comfortable with ambiguities in the knowledge that theories are defeasible and that they change as we learn more and as the methods of science improve. Research that has currency today may be falsified tomorrow. For example, findings from the work of an innatist like Pinker may be debunked soon,88 or may lead to understanding of difference between individuals and, who knows, one day, also groups? By the same token, neuroscientific research that explores how what people see and believe about themselves actually physically shapes and determines how they behave,89 may become a theory with great currency. History textbooks, when they discuss racism and race, need to show the complexities of the topic, while also taking a moral and ethical position. In terms of the implications for textbook writing, and particularly writing about the type of topic that we investigated, we would conclude that in South Africa especially, where there is a strong need to think beyond racialised categories, that "moves towards tolerance and understanding of difference, critical evaluation, independent judgement and creative imagination are paramount".90 We recommend that history textbook authors portray historical events as complex and ambiguous. They should not provide easy or comfortable answers but instead focus on nuances and conflicting interpretations and positions. They should introduce a discourse that in itself is renewing. The book that did not invest in using the terms related to conceptions of "race" in a mantric way also happened to be the book that invited the user to become a scholar of history. In our view these authors did not deny existing discourses, they just made a decision not to perpetuate them. We also suggest that authors be more creative and nurture curiosity and a sense of fun through investigation, incorporating primary sources with proper references and portraying a range of perspectives that allow students to come to their own conclusions. Book 5 could be used as an example of how this can be achieved. Katalin Morgan is currently a researcher, editor, designer and web administrator in the Faculty of Education at the University of Johannesburg. Her research interests are educational media design, theory and methodology and Holocaust studies. Elizabeth Henning is professor of Educational Linguistics in the Faculty of Education at the University of Johannesburg. Her current research focus is teacher development and literacy education, specifically education in the early school years. The financial assistance of the National Research Foundation towards the costs of this research is hereby acknowledged. The opinions expressed and the conclusions arrived at are those of the author and should not necessarily be attributed to the National Research Foundation. 1. G. Bloch, The Toxic Mix: What's Wrong with South Africa's Schools and How to Fix it (Tafelberg, Cape Town, 2009). 2. Report of the History/Archaeology Panel to the Minister of Education, 2000, available online at http://www.info.gov.za/view/DownloadFileAction?id=70331 (accessed 28 July 2011). 3. A. Motshekga, Statement to National Assembly on Curriculum Review Process, 5 November 2009, available at http://www.naptosa.org.za/publications/OBE_Death_Certificate.pdf (accessed 3 September 2011). 4. K. Crawford, "Inter-Cultural Education: The Role of School Textbook Analysis in Shaping a Critical Discourse on Nation and Society", Paper presented at the UK Pacific Circle Consortium 27th Annual Conference, Hong Kong, 21-23 April 2004. 5. Department of Education (hereafter DoE), National Curriculum Statement Grades 10-12 (General) History (Government Printer, Pretoria, 2003). 6. K. Morgan, "Textbooks as Mediators in the Intellectual Project of History Education", PhD thesis, University of Johannesburg, 2011. 7. K. Montgomery, "Imagining the Antiracist State: Representations of Racism in Canadian History Textbooks", Discourse: Studies in the Cultural Politics of Education, 26, 4, 2005, p 437. 8. T. Oteíza and D. Pinto, "Agency, Responsibility and Silence in the Construction of Contemporary History in Chile and Spain', Discourse and Society, 19, 3, 2008, p 354. 9. E. van Eeden, "South Africa's Revised History Curriculum on Globalism and National Narratives in Grade 12 Textbooks, Historia, 55, 1, 2010, p 124. 10. E. van Eeden, "Transcontinental Reflections in the Revised South African History Curriculum on Globalism and National Narratives", Yesterday and Today, 3, 2008, pp 11-40. 11. L. Witz, "Beyond Van Riebeeck", in S. Nuttall, S., and C.A. Michael (eds), Senses of Culture: South African Culture Studies (Oxford University Press, Cape Town, 2000), p 336. Witz examined older and newer South African history textbooks for grades 5 and 8 to establish how the portrayal of Jan van Riebeeck has changed over the years. 12. A. Engelbrecht, "The Impact of Role Reversal in Representational Practices in History Textbooks after Apartheid", South African Journal of Education, 28, 2008, pp 519-541. 13. Cited in Engelbrecht, "The Impact of Role Reversal", p 523. 14. See R. Bain, "Rounding up Unusual Suspects: Facing the Authority Hidden in the History Classroom", Teachers College Record, 108, 10, 2006, pp 2080-2114. 15. For a full analysis of what race and racism mean from a variety of perspectives; how the concepts have changed over time; and the contradictory meanings they have had, see A. de Benoist, "What is Racism", Telos, 114, 1999, pp 11-48. 16. M. Apple, cited in G. Weldon, "Thinking Each Other's History: Can Facing the Past Contribute to Education for Human Rights and Democracy? ", International Journal of Historical Learning, Teaching and Research, 5, 1, 2005 (no pagination). 17. We put this word in inverted commas because the scientific tradition itself is replete with images and symbols, with highly interpretable "paradigms" and this often gets overlooked. See E.B. Johnsen, "In the Kaleidoscope: Textbook Theory and Textbook Research", in S. Selander (ed. ), Textbooks and Educational Media: Collected Papers 1991-1995 (IARTEM, Stockholm, 1997), p 35. 18. R. Britten, "Divergence between Samples of Chimpanzee and Human DNA Sequences is 5%, Counting Indels", Proceedings of the National Academy of Sciences in the United States of America, 99, 21, 2002, p 13 633. 19. D. Godrej, "Race: Unlocking Prejudice", New Internationalist, 260, 1994, p 1. Africa is often said to be the place where this common genetic stock originated. However, in some European textbooks the place of origin of humankind, while not explicitly mentioned, is clearly not Africa or Asia. See for example T. van Leeuwen and S. Selander, "Picturing 'Our' Heritage in the Pedagogic Text: Layout and Illustrations in an Australian and a Swedish History Textbook", Journal of Curriculum Studies, 27, 5, 1995, p 504. 20. D. DeWitt, ">98% Chimp/Human DNA Similarity? Not any More", in Technical Journal, 17, 1, 2003, p 8. 21. J. Eberhardt, "Imaging Race", American Psychologist, 60, 2, 2005, p 189. 22. Eberhardt, "Imagining Race", p 189. 23. P. Fritzsche, "Prejudice and Underlying Assumptions", in Selander (ed. ), Textbooks and Educational Media, p 109. 24. UNESCO, "Textbooks, Curricula, Teacher Training, and the Promotion of Peace and Respect for Diversity" (UNESCO, Washington DC, 2003), p 4-5. 25. See also Council on Interracial Books for Children, "Stereotypes, Distortions and Omissions in US History Textbooks: A Content Analysis Instrument for Detecting Racism and Sexism", Council on Interracial Books for Children (Racism and Sexism Resource Center, New York, 1978), p 178. 26. Oteíza and Pinto, "Agency, Responsibility and Silence", p 355. 27. G. Klein, Reading into Racism: Bias in Children's Literature and Learning Materials (Routledge, London, 1985), p 17. 28. Klein, Reading into Racism, p 17. 29. B. Ribeiro, "Footing, Positioning, Voice: Are we Talking about the Same Thing? ", in A. de Fina, D. Schiffrin and M. Bamberg (eds), Discourse and Identity (Cambridge University Press, Cambridge, 2006), pp 48-82. 30. S. Titscher, M. Meyer, R. Wodak and E. Vetter, Methods of Text and Discourse Analysis (Thousand Oaks and Sage, London and New Delhi, 2000), p 79. 31. DoE, National Curriculum Statement Grades 10-12 (General) History, p 9. 32. See L. Vygotsky, Mind in Society (Harvard University Press, Cambridge MA, 1978); and J. Wertsch, Voices of Collective Remembering (Cambridge University Press, New York, 2002). 33. E. Henning, W. van Rensburg and B. Smit, Finding your Way in Qualitative Research (Van Schaik, Pretoria, 2004), p 102. 34. Henning et al., Finding your Way, p 107. 35. 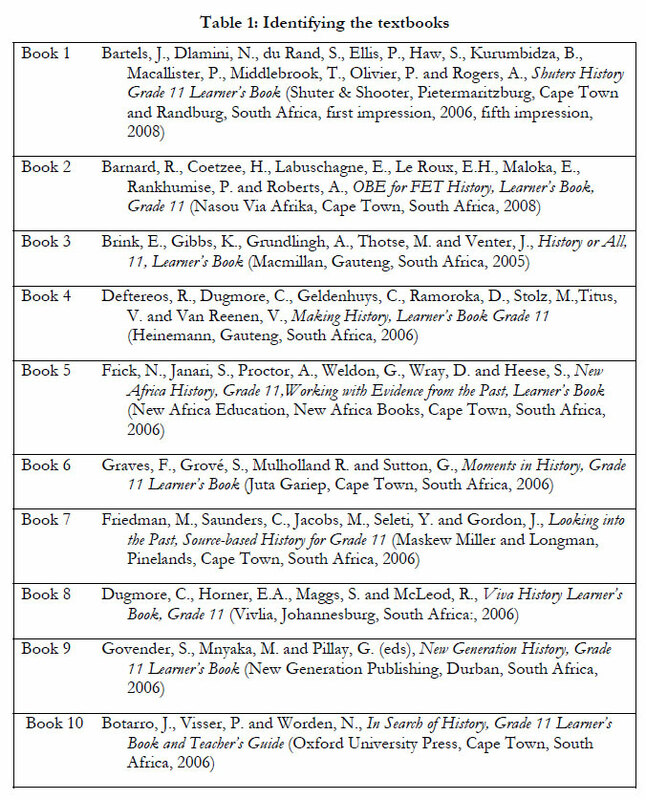 E. Brink, K. Gibbs, A. Grundlingh, M. Thotse and J. Venter, History for All 11, Learner's Book, (Macmillan, Johannesburg, 2005), p vii. 36. Brink et al., History for All, p 96. 37. Brink et al., History for All, p 133. 38. Brink et al., History for All, p 133. 39. S. Govender, M. Mnyaka and G. Pillay (eds), New Generation History, Grade 11 Learner's Book (New Generation Publishing, Durban, 2006), p 172. 40. See P. Lather, "Foucauldian Scientificity: Rethinking the Nexus of Qualitative Research and Educational Policy Analysis", International Journal of Qualitative Studies in Education, 19, 6, 2006, p 785. 41. C. Dugmore, E.A. Horner, S. Maggs and R. McLeod, Viva History Learner's Book Grade 11 (Vivlia, Johannesburg, 2006), p 106. 42. J. Bartels, N. Dlamini, S. du Rand, P. Ellsi, S. Haw, B. Kurumbidza, P. Macallister, T. Middlebrook, P. Olivier and A. Rogers, Shuters History, Grade 11 Learner's Book (Shuter & Shooter, Pietermaritzburg, 2008), p 215. 43. Chromosomes are present in all cells, including blood cells. 44. Bartels et al., Shuters History, Grade 11 Teacher's Guide (Shuter & Shooter, Pietermaritzburg, 2008), p 164. 45. Dugmore et al., Viva History Learner's Book Grade 11, p 113. 46. R. Deftereos, C. Dugmore, C. Geldenhuys, D. Ramoroka, M. Stolz, V. Titus and V. van Reenen, Making History, Learner's Book Grade 11 (Heinemann, Johannesburg, 2006), p 174. 47. Deftereos et al., Making History, Learner's Book, p 174. 48. 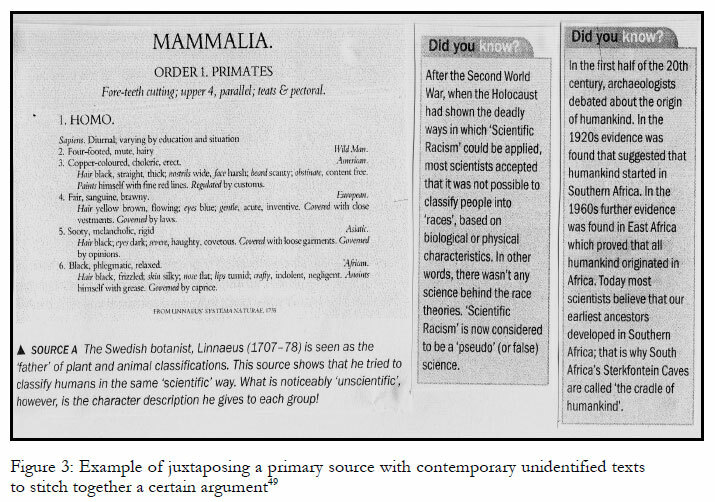 J. Botarro, P. Visser and N. Worden, In Search of History, Grade 11 Learner's Book (Oxford University Press, Cape Town, 2006), p 129. 49. Bartels et al., Shuters History, pp 129-130. 50. M. Monteith, P. Visser, J. Botarro and N. Worden, In Search of History, Grade 11 Teacher's Book, (Oxford University Press, Cape Town, 2006), p 110. 51. Bartels et al., Shuters History, p 198. 52. Fritzsche, "Prejudices and Underlying Assumptions", p 109. 53. Govender et al., New Generation, p 186. 54. Govender et al., New Generation, p 161. 55. Govender et al., New Generation, p 185. 56. Bartels et al., Shuters History, p 230. 57. Bartels et al., Shuters History, p 230. 58. M. Friedman, "History Curriculum as Indoctrination", South African Labour Bulletin, 34, 2, 2010, p 53. 59. DoE, National Curriculum Statement, p 9. 60. L. Chisholm, "Migration, Citizenship and South African History Textbooks", South African Historical Journal, 60, 3, 2008, p 368. 61. Chisholm, "Migration, Citizenship", p 370. 62. Bartels et al., Shuters History, p 217. 63. Deftereos et al., Making History Learner's Book, p 195. 64. Deftereos et al., Making History Learner's Book, p 195. 65. Deftereos et al., Making History, Teacher's Guide, Grade 11 (Heinemann, Johannesburg, 2006), p 179. 66. Bartels et al., Shuters History, p 217. The small images in this figure are the same size and quality as those in the textbook. 67. J.L Austin, How to Do Things with Words (Oxford University Press, Oxford, 1962). 68. DoE, p. National Curriculum, p 26. 69. N. Frick, S. Janari, A. Proctor, G. Weldon, D. Wray and S. Heese, New Africa History Grade 11, Working with Evidence from the Past, Learner's Book (New Africa Books, Cape Town, 2006), p 108. 70. Frick et al., New Africa, p 112. 71. Frick et al., New Africa, p 124. 72. DoE, National Curriculum, p 17. 73. Frick et al., "Doing History", in New Africa, p 122. 74. R. Barnard, H. Coetzee, E. Labuschagne, H. Le Roux, E. Maloka, P. Rankhumise and A. Roberts, OBE for FET History, Learner's Book, Grade 11 (Nasou Via Afrika, Cape Town, 2008), p x. 75. However, this book, as well as book 2 , also showed several instances of simplistic and a-historical positioning, similar to the others. Hence it is not straightforward to generalise from these findings. 76. Botarro et al., In Search of History, p 128. 77. N. Fairclough, Analysing Discourse: Textual Analysis for Social Research (Routledge, New York, 2003). 78. Vygotsky, Mind in Society. 79. Wertsch,Voices of Collective Remembering, p 63. 80. Vygotsky, Mind in Society. 81. J.A. LaSpina, "Designing Diversity: Globalization, Textbooks, and the Story of Nations", Journal of Curriculum Studies, 35, 6, 2003, pp 667-696. 82. Friedman, "History Curriculum as Indoctrination", p 53. 83. Quotes on problem solving, at http://www.leadershipnow.com/probsolvingquotes.html (accessed 7 October 2011). 84. E. Mattson and K. Harley, "Teacher Identities and Strategic Mimicry in the Policy/Practice Gap", in K. Lewin, M. Samuel and Y. Sayed (eds), Changing Patterns of Teacher Education in South Africa (Heinemann, Sandown, 2003), p 288. 85. See A. Giddens, The Consequence of Modernity (Polity Press, Cambridge, 1990). 86. J.W. Loewen, Lies my Teacher Told me: Everything your American History Textbook got Wrong (Simon & Schuster, New York and London, 2007), p 355. 87. See A. Gopnik and A.N. Meltzoff, Words, Thoughts, and Theories (MIT Press, Cambridge, 1997); and S. Levinson, "Covariation between Spatial Language and Cognition, and its Implications for Language Learning", in M. Bowerman and S. Levinson (eds), Language Acquisition and Conceptual Development (Cambridge University Press, Cambridge, 2001) pp 566-588. 88. S. Pinker, "My Genome, My Self", The New York Times, 7 January 2009, available at http://www.nytimes.com/2009/01/11/magazine/11Genome-t.html?_r=1 (accessed 28 July 2011). 90. B. Johannesson, "The Writing of History Textbooks in South Africa", Internationale Schulbuchforschung, 24, 1, 2002, pp 89-95.